The capital of Alcarria experienced in the second half of 19th century a relative cultural and scientific splendour. This happened due to the establishment of some organizations that dynamized knowledge and science. Among these organizations were the Military Engineers Superior Academy together with the Aviation Park, the Teaching Normal School and the Middle Education Institute. Around these organizations a lot of free thinking and recreation associations were born like La Peña, El Ateneo Caracense or Obrero. It is significant that in 1922, when the Academy of Historical Investigations was founded there was included a Sección de Fotografía (Photographic section). Francisco Goñi and Enrique Diges were in charge of this section. We could consider that 1922 was the end of a first period of photography in Guadalajara, the period of pioneers. Since the beginning and as frequently is the case the closeness of Madrid meant an immediate influence, first with the occasional visits and work of foreigner photographers like the Englishman Charles Clifford (c. 1855 – 1856), or the French Jean Laurent (1870), and second with the specific presence of commercial photographers as Ramón Sáez (1853), Amador Cuesta or Florencio Navarro, who moved to Guadalajara in 1883 and were employed in the bureau situated in Main Street 44 opened in 1864 by Francisco Eyré and Vicente Vázquez. Navarro was followed by many others who tried to succeed in Guadalajara like Manuel Ariza (since 1897), Francisco Marí (1906), Ángel Arquer (1912) or the already mentioned Francisco Goñi (1918), more dedicated to photography than to the press. But the true driving force of photography in Guadalajara was the Photograph Service. This organization, linked to the Military Air Base, apart from military interest, functioned as a true photography school, which was later integrated into civil society. In this Service, worked professionals so prestigious and creative as José Ortiz Echagüe, Eduardo Susanna, or José Reyes Ruiz, all of them, part of the photography trends of the time. 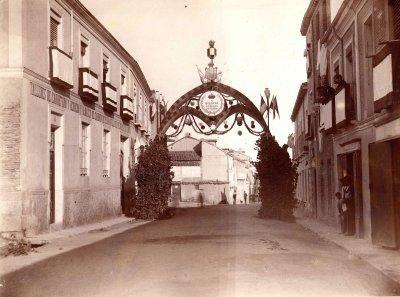 In 1925 Jose Reyes Ruiz opened his own atelier in Román Atienza street. This atelier is still working today. The material used by José Reyes (camera, amplifiers, furniture and lightning system), which had immortalized the image of generations, is used today to reproduce the ideal photographic studio from the first quarter of the 20th century. Finally, in this quick revision of the dawn of photography in Guadalajara we must not forget those amateurs who travelled all around the province with their heavy cameras, taking pictures of landscapes, people, customs and patrimonial richness. Among this amateur photographers we should mention Santiago Martínez Palacios (1884), Tomás Camarillo, Jacinto Abós (1910), or the architect Antonio Vázquez Figueroa (1907).